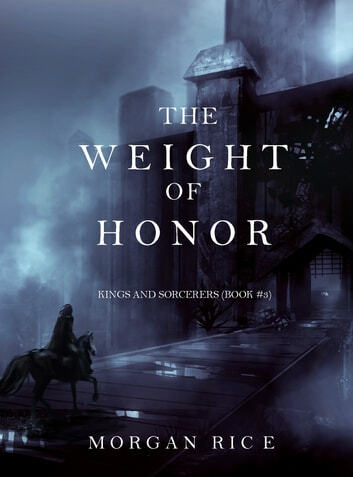 THE WEIGHT OF HONOR is book #3 in Morgan Rice’s bestselling epic fantasy series KINGS AND SORCERERS (which begins with RISE OF THE DRAGONS, a free download)! In THE WEIGHT OF HONOR, Kyra finally meets her cryptic uncle, and is shocked to discover he is not the man she expected. She embarks on a period of training which will test her stamina and her frustration, as she soon encounters the limits of her power. Unable to summon her dragon, unable to search deep within, and feeling an urgency to help in her father’s wars, Kyra doubts if she will ever become the warrior she thought she was. And when she meets a mysterious boy, more powerful than her, deep in the forest, she wonders what her future really has in store for her. Duncan must descend the peaks of Kos with his new army and, vastly outnumbered, launch a risky invasion on the capital. If he wins, waiting behind its ancient walls, he knows, will be the old king and his nest of nobles and aristocrats, all with their own agendas, all of them as quick to betray as they are to embrace. Unifying Escalon may, indeed, be harder than freeing it. Alec, in Ur, must tap his unique skills in the forge to aid the resistance if they have any chance of defending against the looming Pandesian invasion. He is awestruck when he encounters Dierdre, the strongest girl he has ever met. This time she has a chance to make a stand against Pandesia, and as she bravely faces off, she wonders if her father and his men will have her back this time. Merk finally enters the tower of Ur, and is stunned by what he discovers. Initiated into its strange codes and rules, he meets his fellow Watchers, the toughest warriors he has ever encountered, and he finds that earning their respect will not be easy. With an invasion looming, they must all prepare the tower; yet even all its secret passageways may not keep them safe from the betrayal lurking from within. Vesuvius leads his Troll nation across a vulnerable Escalon, devastating the land, while Theos, enraged at what becomes of his son, is on a rampage himself, and will not stop until all of Escalon is aflame. With its strong atmosphere and complex characters, THE WEIGHT OF HONOR is a sweeping saga of knights and warriors, of kings and lords, of honor and valor, of magic, destiny, monsters and dragons. It is a story of love and broken hearts, of deception, ambition and betrayal. It is fantasy at its finest, inviting us into a world that will live with us forever, one that will appeal to all ages and genders. Great adventure story about a girl warrior coming of age and a dragon. Highly imaginative, great writing and easy to read. I get lost in all of Morgan's ebooks and can't wait for the next one to come out. (The weight of Honor) is a nail biter. Couldn't put it down. To get so close to the goal and then having to show your true worth. left me wanting more. This story just keeps getting better. I give the story 5 stars, but the editing does distract from the story – example is in chapter 13 which tells what is happening to Dierdre when she goes to confront her father – uses Krya name instead of Dierdre. There are a number of occurrences like this as well as many grammatical errors.